LOMO cameras will become the new "it" camera. Mark my words. 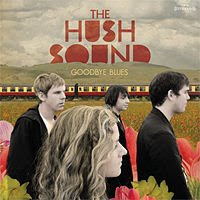 Goodbye Blues,The Hush Sounds' junior album,is definately worth spending your milk money on. The album shows a lot of progress, especially in vocalist and pianist Greta Salpeter's voice. The songs are definately jazz/blues inspired.A great and refreshing album after all of 2007's "hits". With my spring formal (instead of dance or prom, my school has banquets. A quick formula: Prom - Dancing = Banquet) right around the corner, I've been thinking about what kind of dress I want. I made my first dress for my winter banquet and I think I'll continue the tradition with the upcoming spring formal (it's pretty cool to be known as the girl who makes her own dresses). I'll be getting fabric tomorrow and starting it on Thur., so to get inspired I made a quick collage about my idea ,just to get jazzed about it. Yes, I decided to do a tuxedo inspired dress. I'm going to feel pretty snazzy when I ask him to get me a boutonneire* instead of a corsage. I couldn't find an exact example of the dress I want to make,but I have an image in my mind, but sadly the only type of drawing I'm capable is stick figures, so it'll have to stay up there for now. I'm thinking of pairing it with some red heels, but I'll have to wait and see. *I've had this idea for a while: a boutonneire with a red rose and venus flytrap instead of baby's breath. very jack skellington. I think I'll have to try and experiment with that idea. I'll be turning sixteen soon and I'm quite anxious about it. The reason? I'm having a huge birthday party with all my friends but I have no idea what we're going to be doing. Back in December I had mentioned to my mom about something that I thought would be cool to have for my party but she said "Oh, we already planned your party." What?!? So I've been waiting all this time to find out what it'll be. Luckily I got to pass out the invatations today, so I got a bit of a clue. The top picture is a narwal (kind of my signature animal...weird right?) on a motorized scooter, my mom found the picture and I loved it! The second one she put on herself...perhaps a clue hmmm? Some sort of circus theme maybe? I guess I'll have to just wait and see! ps: To find out more about my mom and her other skills go here. psps: I just realized that's the first picture I've ever posted of myself! So yes, that is me. 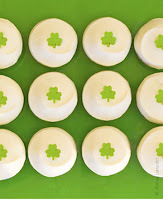 A green post on St. Patrick's Day?!? Hmm, maybe forget that soda bread. But sadly, I've never even tried Sprinkle's Cupcakes, even though I've heard that they're amazing. But after seeing these, I suppose I'll have to change that. Well maybe I better lay off the cupcakes if I want to pull this off. I'm not a huge fan of the new Target Go International line, but there are some pieces I like, such as this. Oh my goodness, I love kitchenware (even though it'll be a good few years till I'll need my own). Blame it on my Jamie Oliver obsession. So have fun today, whether your idea of fun is getting hammered with green beer or watching just watching Flavor of Love reruns (my personal choice), have a great St. Patrick's day!!! well... I've technically been to one that I'd really consider a dinner party (most parties I go to contain playing rock band,eating leftovers and watching lost), but I really do fantasize about them. I love this dress because it's perfect for both an outdoor or indoor party. But wearing this with necklace distracts the eye from the cute gray sides on the dress. I would probably pair this with a loose bun and some gold earrings. Click here for more information. Now technically this is actually a pattern, not a dress, but I still love it. I plan on making it as soon as I finish my other projects (which I plan to post more on later) If you're interested in this FREE pattern, click here. This dress is very retro and somehow looks like a tuxedo. It would look great with some red heels. Click here for more info on it. I really am a sucker for anything vintage. I do try not to look at anything by Marc Jacobs because my heart will break when I see the price. Click here for more. Sigh. On to something a bit cheaper. Wow wow wow. Normally I'm not a big fan of American Eagle Outfitters, but I admit, I really like this dress. The bow on the side just makes it dinner party acceptable. Click here for the details. So I started this blog because magazines can't be published fast enough to satisfy me and most of the good ones have folded anyway (RIP Ellegirl, Jane). I plan on posting pretty much anything to do with the entertainment (well... I don't really want to get into celebrity gossip or anything like that, I'll leave that to Perez) and fashion industry, projects I'm working on and other various things. Please feel free to send me any questions and feedback you have. The first post is always awkward, so I plan just to jump right into this.